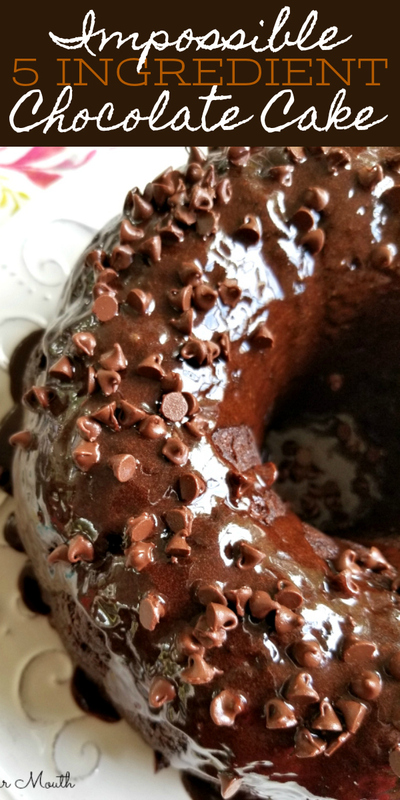 An impossibly moist, fudgy, decadent chocolate bundt cake recipe made with just five ingredients. I’ve mentioned them before, but we have two families that we spend a lot of time with. All of us adults are great buddies and our kids LOVE hanging out with each other. We’ve all sort of become family to each other over the years and it’s great because none of us has much family in the area. I grew up spending every free weekend with my aunts, uncles and cousins so it’s nice to have created something similar for my kids. It’s also nice spending time with other couples who are a lot like Husband and me in that we do almost everything together, with our kids in tow. Anyway, we got together one night to celebrate a birthday and my friend, Amanda, had made a chocolate cake for the birthday girl. I’d gotten my belly full of supper and had a few cold beers in me so I wasn’t too interested in eating any cake. 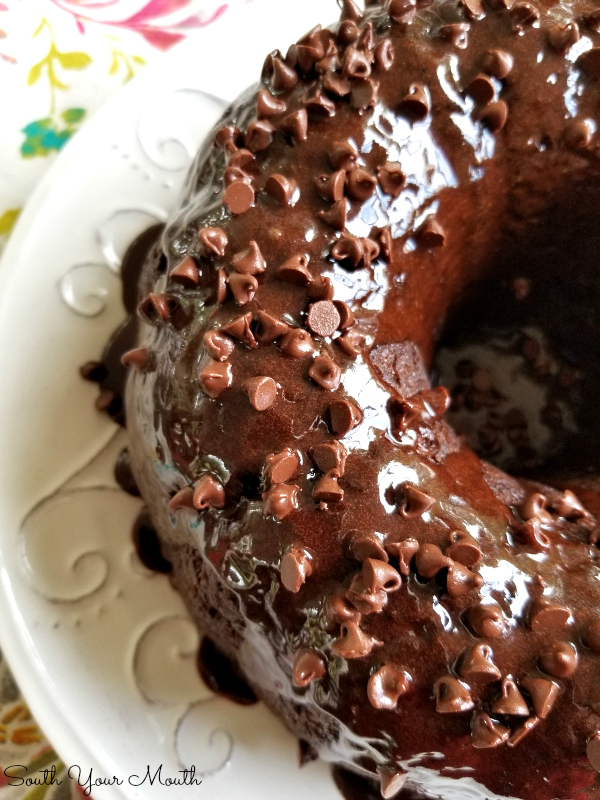 It was a perfect chocolate bundt cake that looked so rich and fudgy and moist I HAD to try it! Especially after listening to the kids rave about how good it was. And, oh my goodness, was it ever delicious! This cake doesn’t need any frosting at all! I spooned a little melted icing and chocolate chips on the one pictured here because I wanted it to be extra beautiful for y’all but it really doesn’t need anything extra. This cake is sorta like a mix between a brownie and a cake. It's thick and fudgy and just BEGS to be eaten with a cold glass of milk or a hot cup of coffee! Amanda told me it is a recipe she’s been making for years that uses a cake mix, pudding mix, and chocolate chips. She said she uses it with all sorts of other flavors too (I’ll list some below). So I shot her a text and she confirmed I had it all right. 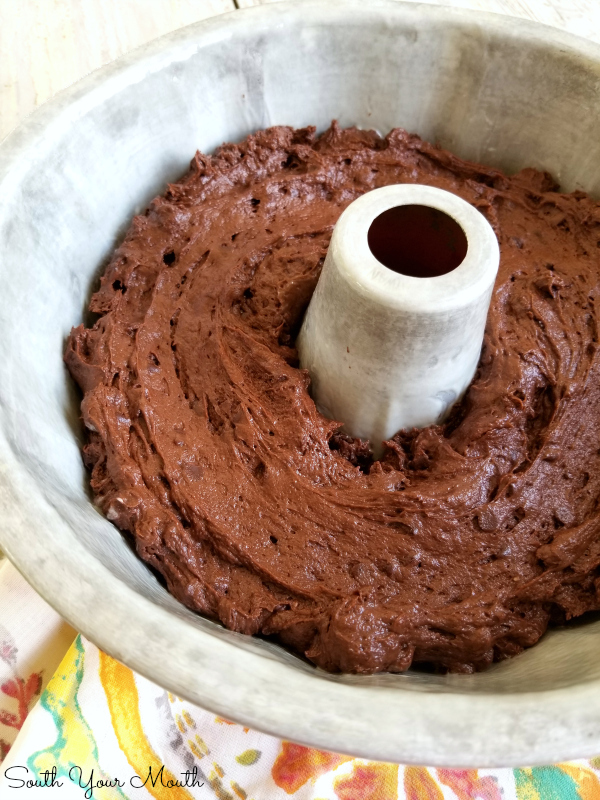 She told me the batter would be thick – like PlayDoh – and that you’ll think to yourself that it doesn’t seem right (um, yep, that’s exactly what I thought!). I mixed it up, popped it in the oven and the cake was just as delicious as I remembered! I've made this twice since the first time and can honestly say I wouldn't change a thing. Don't let the sour cream throw you off. I wasn't scared of it because I LOVE desserts with sour cream and chocolate. I've had a few sour cream chocolate cakes over the years that were sinfully delicious so I knew the sour cream would be perfect with all the sweet chocolate. Don't you love my old bundt pan? I got it at the flea market eons ago and I reach for it over my fancy-pants pans every time! UPDATE: I've just added this list of variations to the printable recipe card per a reader suggestion! This is what the batter will look like - don't let it scare you! It will cook up perfectly! Since Amanda’s cake didn’t have a name and the word that kept coming to mind when I was mixing it up was impossible, that’s what I’m calling this cake! 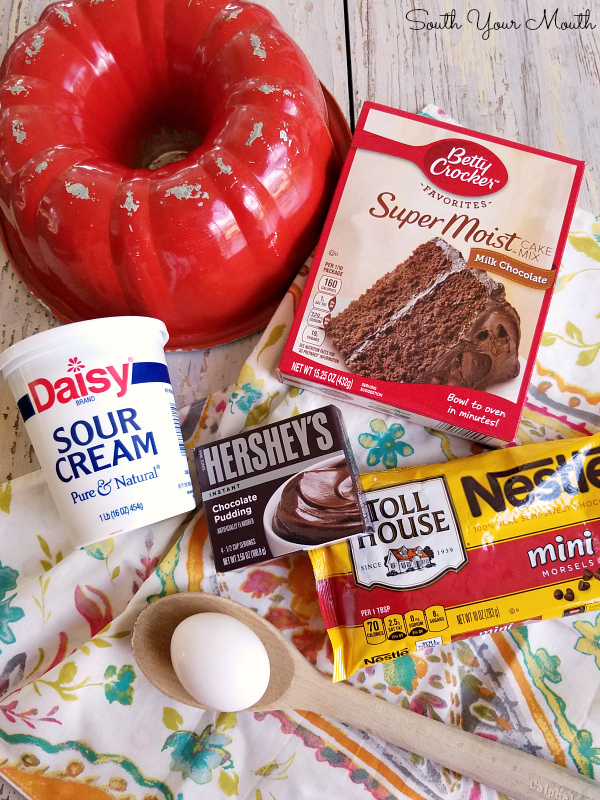 It seems impossible that these ingredients would make such a moist, rich cake - but they do! And it seems impossible to make something so incredibly decadent and delicious with just 5 ingredients - but you can! Preheat oven to 325 degrees. Grease and flour a bundt pan well (I use the cooking spray with the flour in it) then set aside. Combine sour cream and egg in a large bowl or stand-mixer (fitted with paddle attachment) then stir or blend until combined. Add cake mix and pudding mix then stir or blend until mixed well. Stir or blend in chocolate chips (reserving 1/3 cup for garnish if desired) until evenly combined. Bake at 325 degrees for 45-55 minutes or until a toothpick inserted in the middle comes out clean. Cool in pan for 30 minutes then invert onto a serving plate to finish cooling. Garnish with powdered sugar if desired. Cover and store at room temperature. 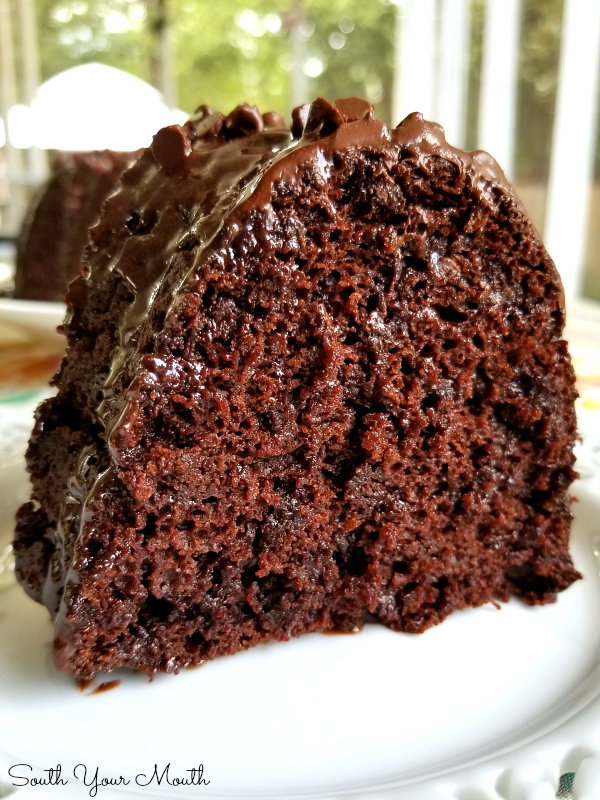 This cake doesn’t need any frosting but you can make a simple glaze or heat a small amount of prepared chocolate frosting for 30 seconds then drizzle over the cooled cake. Garnish with reserved chocolate chips if desired. Use regular or mini chocolate chips. I suggest using your stand mixer with paddle attachment because this batter is THICK. 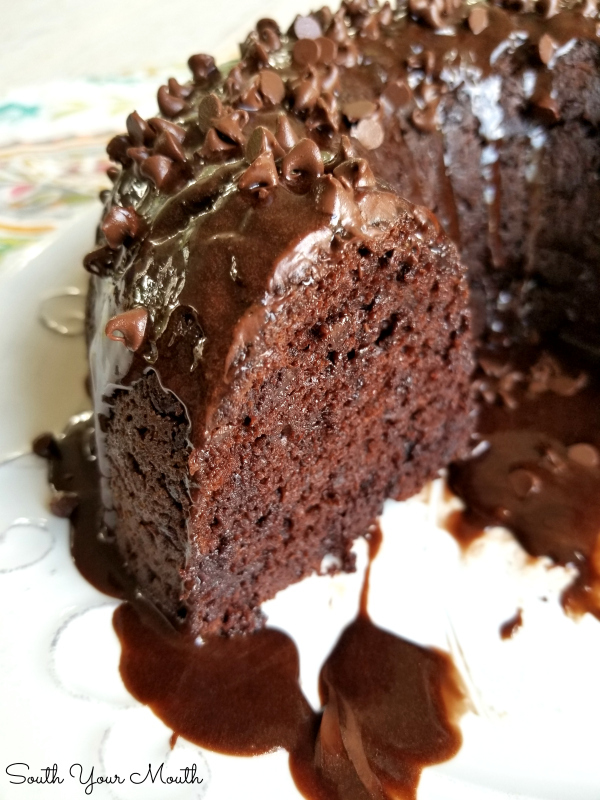 This recipe uses a standard size (15-16 oz) cake mix, a regular size (10-12 oz) bag of chocolate chips and regular size (4-serving) pudding mix. Do not prepare the pudding – just use the dry mix. I think this could be made in a 13x9 baking pan. Cook for 20-25 then test with a toothpick. I also think these would be great cooked in a muffin tin. Cook for 15-20 then test with a toothpick. 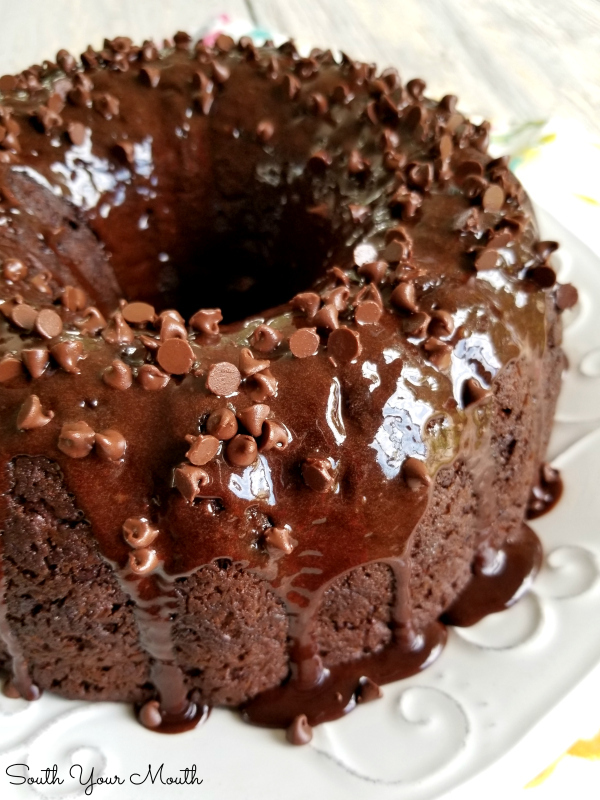 Check out this recipe I found for Breakfast Bundt Cake if you're looking to try something savory in your favorite bundt pan! This looks so fun, I had to share! I just added the list to the printable recipe card. Great idea! YUM! That sounds amazing! So, just prepare the pudding, stir in the dry cake mix then top with chocolate chips and pecans? Is that right? You can totally make it without the chips! I made the lemon cake last night and it was fabulous! I left it plain no frosting nor chips but served each slice topped with lemon curd and a dollop of whip cream. My party guests loved it! Thanks for the recipe. Is there any substitution for the sour cream? I agree. I'm curious too. I don't care for sour cream in my desserts at all. I've tried it and don't like it. But I do want to try this cake! None that I can think of. Sorry! I would suggest trying Greek yogourt instead of sour cream. I haven't tried it but they have similar consistancies. Holy Cow! I love simple, easy and delicious recipes. I will definitely be trying this one out. I made it. It's amazing. Five family members and everybody loved it. Including me, and I'm a little picky about desserts because I don't like a dessert to be "too sweet." Well, this is sweet, but the chocolate-y-ness makes it just fine. I didn't do any frosting, just put all of the mini-chips into the batter. I'm sorry, but you don't list the size of cake mix or pudding. Cake mixes have changed in size within the past few years from 18 oz. to 15 oz. That's a pretty big difference when baking. Can you l kease advise? I'm sorry Mandy, I did go back and read again. The sizes are listed. Now if only there was a conversion for this to cook in Instant Pot! This looks really delicious! Saw it featured on Meal Plan Monday! Congrats! Can I use a 9 x 13 cake pan? I did. Baked it for 40 minutes at 325. Has anyone tried using a gluten free cake mix? I made this in a 9×13 pan. It ended up baking at 325° for 40 minutes. Great recipe! I made this over the weekend and omg it was fabulous!!! Thanks for the recipe!!! I am not that great of a cook and would ask for the vanilla recipe, can you blend in some sort of fruit or filling and if so would you have to change any ingredient??? I would think you could keep the recipe exactly the same then add 2 cups drained fruit or pie filling. Let me know if you try it! If I wanted to make a Sweet Potato Pound Cake, could I add a little nutmeg and some mashed sweet potatoes to the Spice Cake Mix? If so, how much sweet potato? Hmmmmm... I'd sub pumpkin for the sour cream, use a spice cake, either butterscotch vanilla or pumpkin spice pudding then add pecans or walnuts instead of morsels or chips. Let me know if you try it! recipe for "Buffalo Feathers" but for some reason it won't print. Have any idea why? 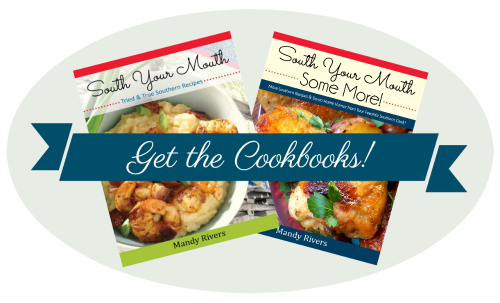 Please continue with your delicious recipes and your humor. Enjoy your site so much! Hi Mandy - do the chocolate chips melt or stay solid? This is without a doubt the BEST Chocolate cake in the worldd. It beats "Portillos" and "Costcos" hands down. I have looked for this recipe for years. Made it for Christmas Eve, and was sorry I only had one cake, as my company kept coming back for more. For frosting I made a chocolate glaze. This will bee my forever chocolate cake recipe. I'm so glad you enjoyed it! Merry Christmas! I would like to bake this in loaf pans, How long do you think, 45 mins??? I'd start checking them at 40 minutes! Good luck! I'm chocolate obsessed and I can't wait to try this recipe! Just made your cake it was hard to finish without a stand blender but it is worth the work out! For lemon do I also add an egg and the same amount of sour cream (16oz)?